Cheeseburger Baby is my wife Marcela’s favorite Burger joint. She would live at this place if it was possible. And as far as Miami is concerned, it’s the Burger Icon on South Beach having just turned 10 years old (2010). If you’re ever in need of having a Burger fix at 3AM on a Wednesday then this is your go-to place. Whenever we’re here my wife Marcela always like to start out with an order of Onion Rings. They’re not homemade but they do the job plus they have some nice seasoning on them. Now, the Chili Cheese Fries are a whole other thing. These fellas are highly addictive. Yes, there are Beans in this Chili but that doesn’t stop this BB machine, add some Jalapeños while you’re at it. I love their melting technique which I guess you’ll just have to see in person. Since I love the Chili it only stands to reason I’d also try the Chili Cheese Dog. Once you close up that bun, you’re fighting to keep everything inside. Again, I’d suggest adding Jalapeños to the mix even though I’ve never had it that way. The Chicken Tenders aren’t too shabby either. One of the things as of late that I’m obsessed over is the sear on the outside of a Burger Patty. I was watching a master at work cause my Burger had one of the most beautiful sears I’ve seen. It was cooked a perfect Medium and that Bacon was so crunchy & delicious it belongs in a Breakfast sandwich. 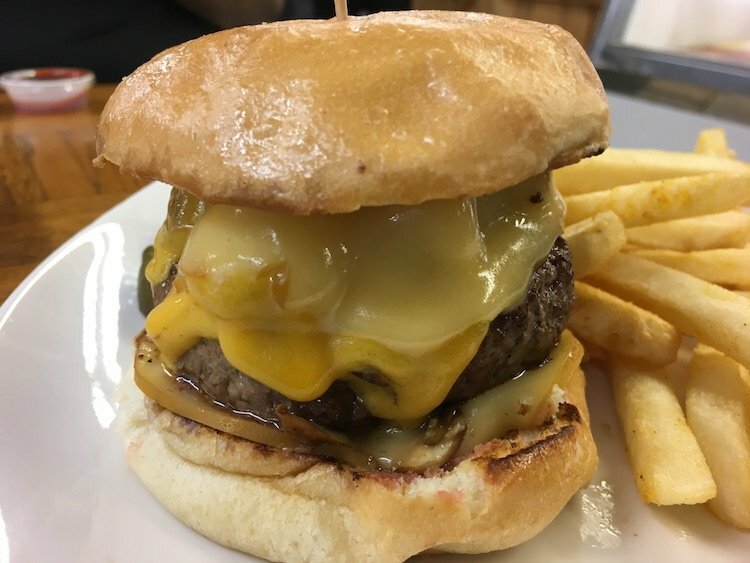 Cheeseburger Baby has a great Burger which is why they’ve outlasted all these pretenders opening up near them and trying to steal their thunder. If you haven’t had them, you should be ashamed cause after 10 years they’re still doing it the right way, their way. Be on the lookout for the Cheeseburger Baby Food Truck all over town and at my Food Truck events! P.S. : Remember, “it doesn’t take 5 Guys to make a Cheeseburger, Baby“, their phrase not mine.